Modern online marketing is all about creating useful website content that is valuable to your target audience, but to understand HOW to create useful content, you need to know WHY content is so important. This comes down to a fundamental shift in how people respond to marketing, and a much greater emphasis on encouraging potential customers to choose you by providing them with value. This topic could take up a whole guide on its own (take a look at Hubspot’s History of Marketing post), so we’ll focus on providing you with a quick overview. Essentially, the internet, and more recently social media, has completely disrupted the way people shop for products and services. Buyers were often at the mercy of businesses who were able to manipulate brand perception and exert influence over shopping habits. Consumers had few resources to help them decide which would be the best option when considering alternatives. However, companies also had one great marketing asset that also generally resulted in a better experience for the individual searching for a product or service: the recommendation. If you were looking for a decorator, for example, it’s likely that you’d ask your friends and family if they knew of someone reliable before jumping into the Yellow Pages. These advocates would be doing a company’s marketing without being asked or incentivised – they simply believed in them enough to recommend their services. The influence of content is such that it plays a role in every one of the marketing methods listed above. Raising awareness: by showing people what they have to offer, businesses hope to either encourage spur-of-the-moment purchases (think advertisements for toys in the breaks between kids’ TV programmes), or plant a seed – “I have no need for this innovative vacuum cleaner now, but when mine breaks, I’ll definitely bear it in mind”. Capturing the need: the bulk of our purchases come as a result of our own needs and wants. For example, you might need a plumber to fix a broken pipe, or a new pair of trainers because you’ve decided that you’re the next Usain Bolt. In these instances, we will search for solutions to our problems. The companies that are most successful in capturing these needs are the ones who are highly visible when people search for solutions. Modern-day marketing has brought about transparency. Power now lies with the consumer, who can easily find and compare products and services online. Consumers are able search for a solution that they feel aligns most closely with their requirements. According to Hubspot’s research, modern inbound marketing costs 62% less than traditional outbound techniques. So why is content important? Publishing the right website content at the right time will help you as a marketer connect with your prospective customers. It’s your chance to make an emotional connection by demonstrating that your company is the right fit for their specific problem. 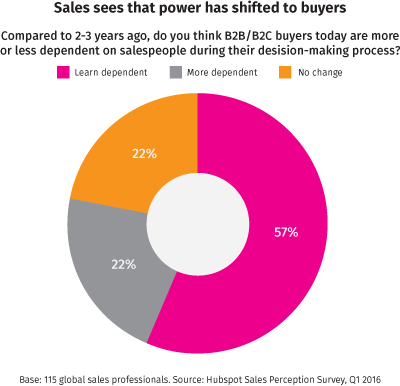 A report by Demand Gen found that 47% of buyers viewed 3-5 pieces of content before engaging with a sales rep. The content that your prospects require isn’t limited to simply describing your product or service on your website, it’s a process that starts much earlier on – in some cases, even before the individual has decided they have a need for it. 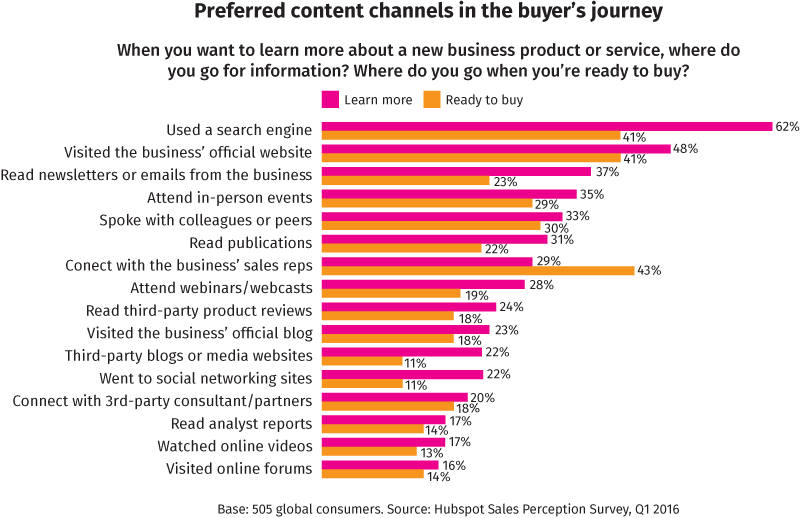 Businesses must therefore create content that is useful to people at each stage of the buyer journey in order to maximise their chances of converting prospects into customers. Without doing this, it stands to reason that companies will be losing business (and, therefore, money) to competitors who have a better content marketing strategy in place. According to the Content Marketing Institute, B2B marketers allocate an average of 29% of their total marketing budget to content marketing, there’s a good chance that your competitors will pull ahead of you if you don’t take steps to catch up.